Before Tim Burton was known for bringing Batman to the big screen, he made his name directing weird, offbeat comedies. First came Pee-Wee's Big Adventure, which was Burton's debut film, paving the way for the even weirder Beetlejuice in 1988. Now, more than twenty years later, fan interest in a sequel remains high. The last we heard about Beetlejuice 2, screenwriters David Katzenberg (producer of the Gremlins and It remakes) and Seth Grahame-Smith (Abraham Lincoln: Vampire Hunter) were still working on it, with Grahame-Smith saying it was still a reality. Not only did the project have Tim Burton's blessing and the apparent interest of original stars Winona Ryder and Geena Davis, (with Michael Keaton's involvement still up in the air), but when asked a year ago if Burton would want to direct it, his answer was yes. "...we can happily confirm that Tim Burton IS looking to direct the sequel himself. No word yet on scheduling or if the movie is near a green light in the development phase. What we know is that Burton wants to do both 'Miss Peregrine’s Home For Peculiar Children' and the new 'Beetlejuice.' "
Until this rumor surfaced, there had been zero rumblings in the film blogosphere about any of this. With Burton's last effort, the 3D animated Frankenweenie, he regained some of the goodwill that the hollow spectacle of Dark Shadows had squandered. The director's next project is the (relatively) low-budget art-world biopic Big Eyes, which has so far been flying under the radar. With this in mind, the notion of Burton returning to Beetlejuice universe is less unthinkable now than it was a couple of years ago, especially if the script is as good as reported... and nowhere near the Beetlejuice Goes Hawaiian concept which was originally pitched back in the late '80s. Still, there is absolutely no official confirmation from Burton's camp that he'll be directing, and while the screenwriters have reportedly tailored the script for Michael "the ghost with the most" Keaton himself, there is no hard confirmation that he'll return to the role. We were skeptical that this project would ever get off the ground a year ago, and frankly, we're still skeptical now. A two decades-later revisiting of this classic romp could be worthwhile - and the character had a successful run as an animated series - but the original movie is such a deeply strange and singular experience that a sequel still feels unnecessary. What do you think, Screen Rant readers? Do you want to see a sequel to Beetlejuice. 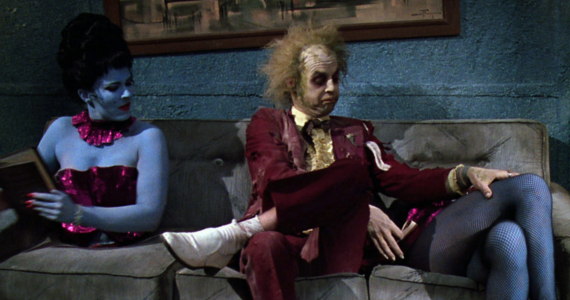 Beetlejuice 2 is still in development.